Port Huron’s Blue Water Bridge today. Perhaps Port Huron’s greatest claim to fame is the Blue Water Bridge, a historic arcing bridge that serves as a means of transportation between Canada and the United States. 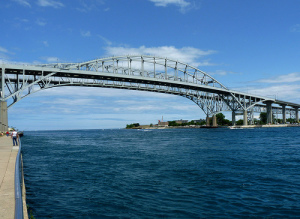 The bridge is located over the St. Clair River, and connects Port Huron, Michigan, to Sarnia, Ontario. In 2013 the Blue Water Bridge celebrated its 75th anniversary, and a closer look at its history show why Port Huron residents take pride in the structure. The original Blue Water Bridge was constructed in 1938, and was built by the American Bridge Company of New York, and the Hamilton Bridge Company of Ontario. The original bridge is an arch cantilever bridge, which was designed to not only support large amounts of traffic, but also to have an aesthetic arching look. In the late 1980’s the border crossing became so popular that plans for a new bridge were brought up. However, instead of demolishing the old bridge a new one was built in 1997 beside the old bridge, to support eastbound traffic. The Michigan cost for building the new bridge, and renovating the old one was $62.6 million dollars. (Michigan Department of Transportation) The project was considered an enormous success and won awards from the American Society of Civil Engineers, the Ontario Institution of Steel Construction, and the Federal Highway Administration. For Port Huron residents the bridge signifies the close connection with Canada, and the willingness of the two sides to work closely together.